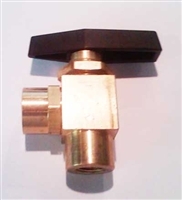 1/8" NPT Male to 1/8" NPT Female parking brake valve. Screws right into the pressure port of the hand operated master cylinder. 14307 Nose Wheel Hub Assembly 5/8"
Panel Mounted Parking Brake Valve. This one is designed to mount in a panel and is to be plumbed inline with the brake system. 1/8" NPT Ports. 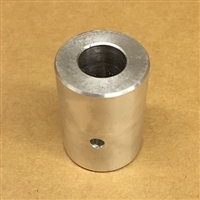 This on is designed more for heel/toe type brakes where you need to mount this in a location where you can reach it with your hand. This one needs to be spliced in each brake line and would need a compression fitting on each side either a 44756 straight or 44840 elbow. This is a set for the left and right gearleg adapter for the Challeger Metal Gear Leg. The Black Max Axle is TIG welded to a chromoly sleeve at a 30 degree angle to make it easy for you to adapt the Black Max Brakes to your plane. 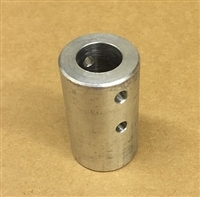 The axle size is 5/8" and the chromoly sleeve is 1.25" OD with .058 wall. You will have to drill the hole through the sleeve to mount to your gear leg. 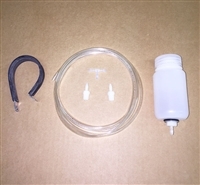 This is a set for the left and right gearleg adapter for the Challeger Fiberglass Gear Leg. The Black Max Axle is TIG welded to a chromoly sleeve at a 30 degree angle to make it easy for you to adapt the Black Max Brakes to your plane. 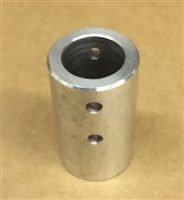 The axle size is 5/8" and the chromoly sleeve is 1.625" OD with .058 wall. You will have to drill the hole through the sleeve to mount to your gear leg.